The new H2000 hydrogen leak detector from John Morris Scientific is a unique instrument for industrial leak detection and tightness control. 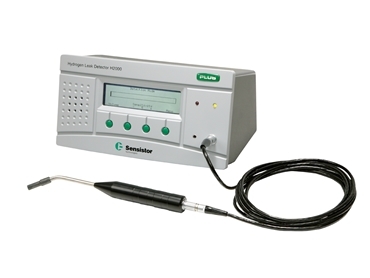 The H2000 hydrogen leak detector is highly sensitive and can be used to find leaks as small as 5 x 10-7 mbar x l/s, comparable to leaks 1000 times smaller than detectable with traditional soapy water or bubble tests. Hydrogen leak detection is carried out with a safe 5% hydrogen in 95% nitrogen gas mix. The hydrogen is quickly transported to the leaks and dissipates much faster than other gases which means testing and re-testing is much quicker than with other gases. Hydrogen is also a renewable gas, environmentally sound, certified as food additive and much cheaper than other gases. The H2000 hydrogen leak detector is small, robust and suitable for leak detection in tough factory environments. Leaks in wet objects can be detected when the probe is equipped with a protective cover. Background interference is minimised by the dynamic background compensation, with a useful auto-zero function. The H2000 is based on modern microelectronics and virtually maintenance free due to no vacuum pump technology being necessary for the detection process.